Robyn Loxley can't rest now that she's the #1 Most Wanted Fugitive, Robyn Hoodlum. The harsh Nott City governor, Ignomus Crown, may have increased the reward for her capture, but this won't stop Robyn from masterminding her biggest mission yet: infiltrating the governor's mansion to rescue her parents. The perfect opportunity arises when the Iron Teen contest comes to Sherwood. If Robyn scores high enough, she'll be invited to a dinner at the mansion. But performing well in the contest could put her directly in Crown's sights. Can she and her crew of misfit friends pull off such a grand scheme, or are they walking into bigger trouble than they can handle? 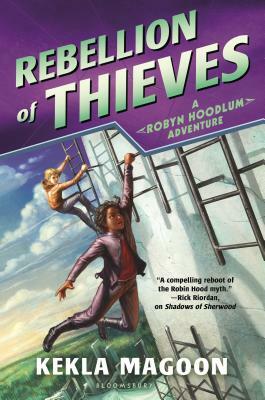 Continuing her high-adventure Robin Hood reboot, National Book Award finalist Kekla Magoon delivers more action and intrigue, as this unforgettable heroine and her motley crew fight for justice.